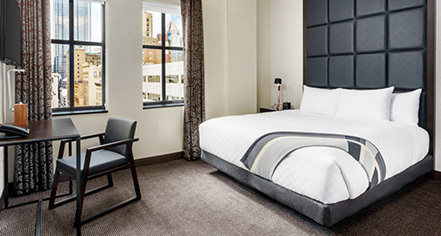 Situated within the beautifully-revitalized walls of a historic Salvation Army charity center, Distrikt Hotel Pittsburgh, Curio Collection by Hilton possesses accommodations that are nothing short of spectacular. Each one of its newly-renovated guestrooms radiate a sophisticated charm that will certainly impress all who relax inside them. These wonderful spaces deliver the best in contemporary comfort, offering an abundance of luxurious amenities that include designer toiletries, complimentary refreshments, and the latest audiovisual technology. 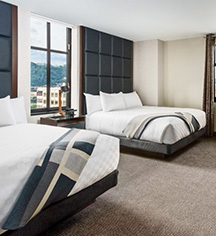 The Distrikt Hotel Pittsburgh also features an array of incredible suites that epitomize the essence of true luxury. These excellent rooms offer cozy living spaces and large, marvelous baths that guests will find to be simply stunning. And those who wish to have a truly memorable stay will especially relish the Presidential Suite located on the tenth floor, with its ample workspace, eloquent décor, and quaint rooftop patio. Throughout the recent renovations, the Distrikt Hotel Pittsburgh endeavored to guarantee that every single one of its accommodations would be accessible to all. As such, its guestrooms and suites are fully ADA compliant. The hotel even offers a selection of rooms that have been specifically designed for those traveling with physical limitations. Not only do these rooms come with the standard guestroom amenities, but they also have additional features, including spacious walk-in showers and lowered bedframes.